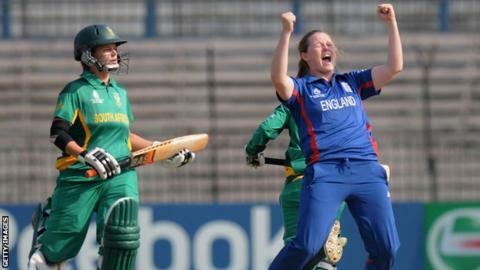 Anya Shrubsole says the seven-wicket victory over South Africa in Cuttack was a "perfect day" for England. Shrubsole took 5-17 as the Proteas were bowled out for 77, with England then reaching the target inside 10 overs to keep their World Cup defence alive. "We wanted to come out here, bowl first, get South Africa out for as little as possible then knock them off as quickly as we could," 21-year-old Shrubsole told BBC Sport. "It was a perfect day for the team." Defeat in Cuttack would have sent England out of the tournament and, even though they registered a comfortable victory over the Proteas, Charlotte Edwards's side still face a struggle to earn the right to meet Australia in the final. England must beat New Zealand on Wednesday, with the defending champions waiting on the result of Monday's match between the Kiwis and West Indies before finding out exactly what is required of them. If West Indies win, England need Australia to beat the Caribbean team in their final Super Six match. A New Zealand victory leaves England needing to beat the Kiwis by such a margin that their net run-rate improves past that of the Black Caps and West Indies. "There's been calculations flying around," added Somerset seamer Shrubsole. "But most of all we know we needed to come here and win well. "We're really pleased to have done that so we can now look forward to the New Zealand game. Once the New Zealand-West Indies game has been played we'll be in a better position to see what we need to do against New Zealand. "But New Zealand are one of the best teams in the world, so we know we'll have to put in a performance similar to what we have done today." One concern for England is the form of wicketkeeper Sarah Taylor. Taylor made headlines before the tournament with talk of a possible switch to men's cricket, but, after two successive first-ball ducks, she again failed to get off the mark against South Africa. "I don't think she's been fazed by that [the potential switch to the men's game]," said Kent batter Lydia Greenway, who made an unbeaten 25 to see England over the line in Cuttack. "She's the type of player to just get on with things. "She's a world-class player, one of the best batters in the world. You don't become a bad player overnight and I'm sure there's a big innings around the corner for her. "She's got a good head on her shoulders and I'm sure she'll just be worried about making sure we perform well in the rest of this World Cup."